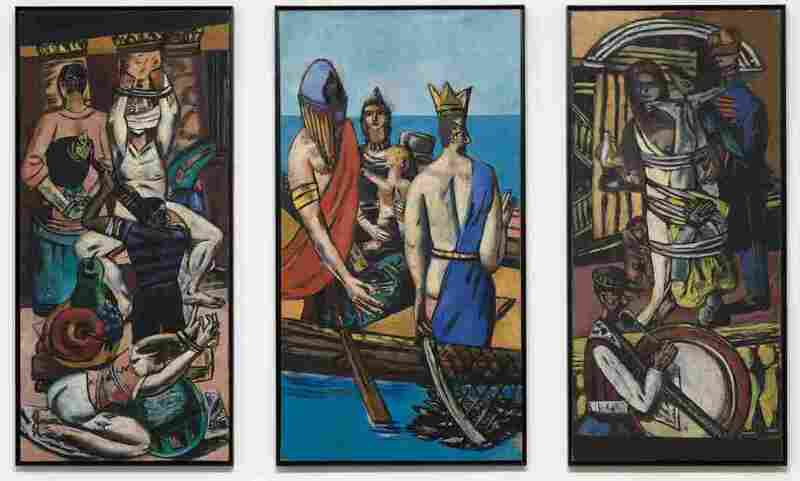 Max Beckmann Returns To New York, In New Exhibit At The Met On sunny December day in Manhattan, the great German painter had been on his way to an exhibit featuring his latest self-portrait when he died. Now, that painting is back in the city where he left it. 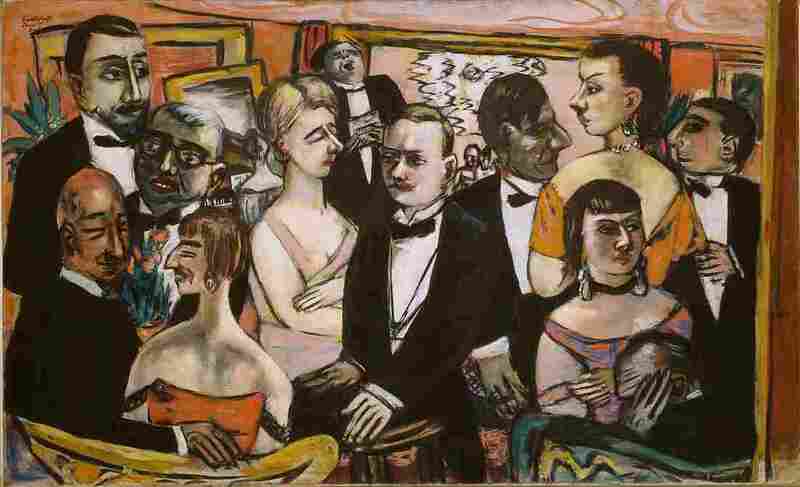 One late December day in 1950, Max Beckmann was standing on a street corner near Central Park in New York City. The German expressionist painter had been on his way to see an exhibition featuring his work at the Metropolitan Museum of Art. Called "American Painting Today," the show was displaying his Self-Portrait in Blue Jacket. It would turn out to be his last self-portrait. "Unfortunately he never made it to the Metropolitan Museum," says the Met's Sabine Rewald. "On the corner of Central Park West and 69th Street, on the side of the park where there is an entrance, he had a heart attack and he died." Now, Rewald is helping Beckmann return to Manhattan. She's curating a show called "Max Beckmann in New York," which features 39 paintings from the artist. And, as Rewald tells NPR's Mary Louise Kelly, that includes the very self-portrait Beckmann had been on his way to see on the day of his death. "It is the centerpiece," Rewald says. 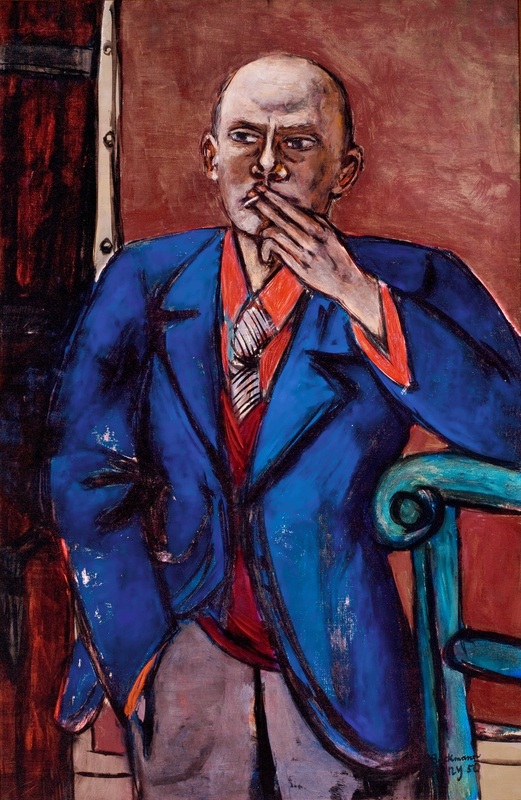 Self-Portrait in Blue Jacket (1950), by Max Beckmann. The painter had been on his way to see an exhibit featuring this self-portrait at the time of his heart attack. 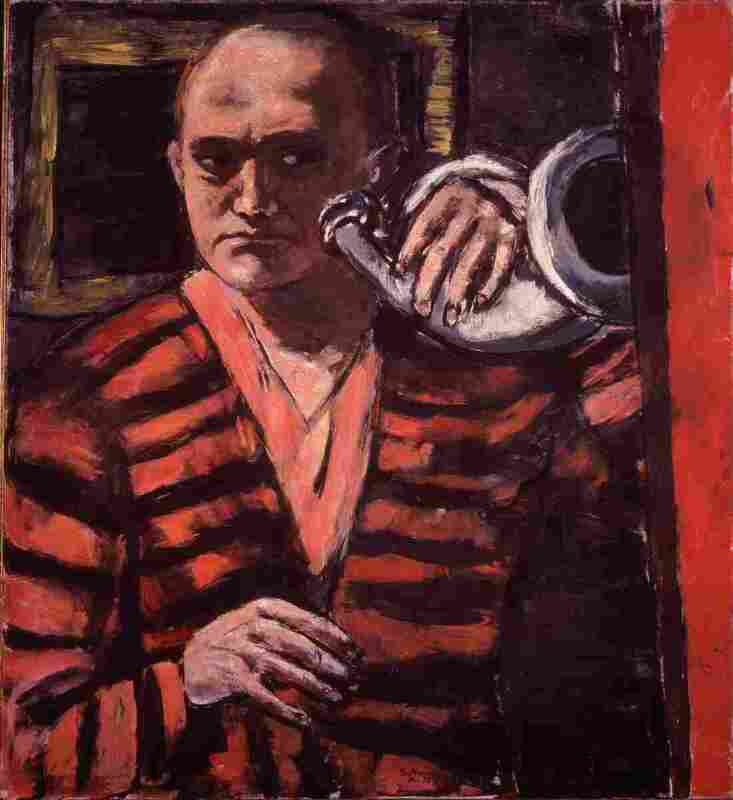 It is, as always, a painting that — Beckmann shows himself smoking. And he has a bright blue jacket and his shirt is sort of reddish. He painted with much louder colors, I must say, when he lived here in New York. He lived here for 16 months. He was driven, and he painted often hours and hours in his studio also at night. And he used neon light, so I think the neon light makes his colors somewhat sharper and more bright. He was in the beginning an expressionist then briefly was part of what is called new objectivity, realism. And then, in the late '20s, early '30s, he mingled often mythology with realism, and that had to do also because of the rising National Socialism [also called Nazism]. You see, in 1931, after spending 15 years in Frankfurt, he moved to Berlin and he thought Berlin, a larger metropolis, would in a way be more secure for him, because his painting by '33 was condemned as so-called "degenerate" by the National Socialists. And then he moved to Amsterdam, where he would spend the next 10 years in voluntary exile. He never went back to Germany. He stayed in Amsterdam until 1947 and then Beckmann was invited to teach in St. Louis. 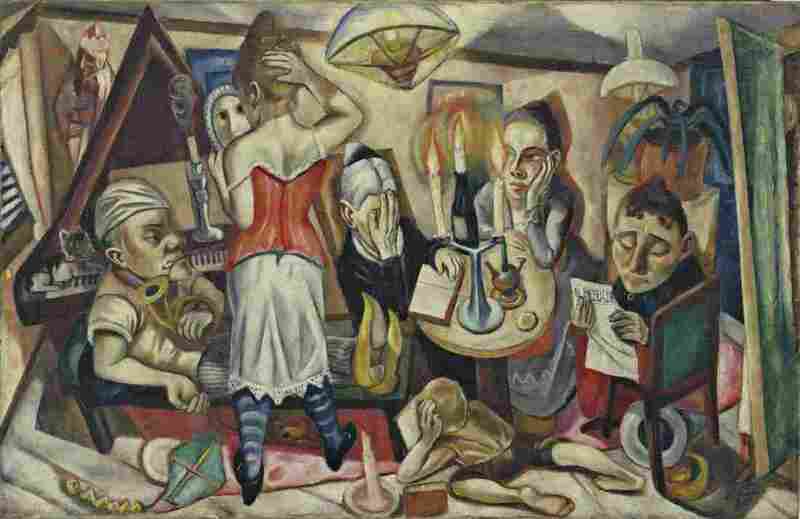 And so Beckmann left, and then in 1949 he was appointed to teach at the Brooklyn Art Museum school in New York, so he came to New York and felt that was the end of exile. He said New York is like Berlin — 10 times as vibrant — so he loved New York. I think Beckmann's place as a German artist is comparable to [Pablo] Picasso's place. Beckmann is our most important, well, dead German artist. I think he would have liked it very much. He would have said in his typical, cynical, humorous way: "Nice little show."